Blood vessels taken from a dinosaur fossil. 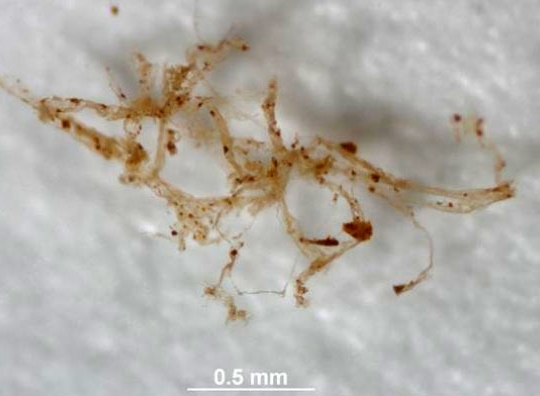 In 2005, Dr. Mary Schweitzer shocked the paleontology community by reporting that she had found soft tissue in a Tyrannosaurus fossil that was thought to be 65 million years old.1 One type of soft tissue structure found appeared to be branching blood vessels like those shown in the picture above. The idea that blood vessels could have remained soft for millions of years is contrary to everything we currently know about biomolecules and their decay, so many in the paleontology community searched for some other explanation of Dr. Schweitzer’s find. For example, its possible that despite its appearance, the structure isn’t composed of blood vessels at all. Instead, it could be the result of a recent colonization of bacteria or fungi. After all, when the blood vessels in a bone decay away, the “tunnels” in which they were housed remain. What if rather recently, a colony of bacteria took up residence in those same tunnels? These organisms often leave a slime (called a biofilm) behind, and if they left it in those “tunnels,” the biofilm would take the shape of the “tunnels.” That would make the biofilm look and behave a lot like blood vessels. When biofilms coat a substrate, and that substrate is subsequently removed, the biofilm will retain much of the original morphology. This can explain the quantity and similarity of structures found in fossil bone and indicates that these structures are unlikely to be preserved dinosaurian tissues but the product of common bacterial activities. Since then, however, the analysis of a variety of soft tissue found in dinosaur bones has lent a lot of support to the idea that these tissues are not biofilms, but are genuine dinosaur tissue (see here, here, here, and here). It seems that the definitive paper has finally been published, showing, at minimum, that soft blood vessels found in one dinosaur bone do come from the dinosaur itself. In the Journal of Proteome Research, Timothy Cleland and his colleagues studied a leg fossil from a Brachylophosaurus canadensis specimen, which is supposed to be 80 million years old.3 They got rid of the hard materials in the leg fossil and examined the soft tissue that remained. They found proteins that were quite consistent with blood vessels. For example, one of the proteins they found was myosin, which is a common component of the muscles associated with blood vessels. When all data are taken into consideration, the most parsimonious explanation is that these vessels, derived from demineralized dinosaur bone, are endogenous. In other words, these really are the soft remains of dinosaur blood vessels. Now it’s important to note that Dr. Schweitzer (who is a part of this study) has suggested a mechanism by which soft tissue might be preserved over millions of years.4 I have discussed why I don’t think her proposed mechanism can explain such remarkable preservation (see here and here). Instead, based on my understanding of the thermodynamics of large biomolecules, it is much more reasonable to interpret this soft tissue as evidence that these bones aren’t millions of years old. Regardless of whether or not I am right on that point, the results presented in this paper are very important. They should put to rest any remaining doubt that some dinosaur fossils do, indeed, hold soft tissue from the dinosaurs themselves. There are way too many slanted news websites with agendas. So whenever I research this topic, instead of getting just the facts, I get another news article mocking creationism. Your blogs, however, are quite reliable in telling it the way it is. I realize that you do give your opinion, but at least it is respectful and not like the numerous liberal news writers who use every opportunity given to make creationists sound unscientific and unintelligent. Thanks for saying what we are all thinking. This blog is a persistent tab in my browser and I check it every day. I love how he presents the data and clearly states his interpretation of it while encouraging us to draw our own conclusions. I wish more people in the scientific community would take that approach. All dinosaur, so called, fossils are from creatures killed in the first days of the biblical flood. So 4500 years ago. not so long. So a quick preservation, which is the essence of fossilization, could keep soft tissue elements around. Its so unlikely its millions of years however they might say if the preservation is as quick as creationists say then the same process might keep sof tissue preserved regardless of time. 4500 years is long too. Its all about the preservation ideas. It seems to me that the presence of osteocytes with intact filopodia as found by both Mary Schweitzer’s group and Mark Armitage would be extremely difficult for biofilm to simulate. I understand how the blood vessels could be explained as possibly being biofilm, but the presence of well preserved osteocytes is very difficult to fit into the biofilm explanation. For anyone who wasn’t already convinced by the presence of intact osteocytes, the study adds further confirmation that the tissues are of dinosaur origin. I guess the important thing for me is that you can’t be sure the osteocytes are soft. They don’t appear to be mineralized, but I don’t know of any way to test to make sure. Here we have something that we know is soft and we now know is original. In the case of both Armitage and Schweitzer, the osteocytes were associated with soft stretchy tissue. Armitage even found them within sheets of soft tissue with filopodia infiltrating multiple layers of tissue. Mineralized osteocytes within layers of stretchy soft tissue would be counterintuitive. If the cells had been mineralized I would have expected to see only osteocyte cell bodies with the filopodia fractured from the cell wall. I agree the study is further proof that the tissues are original biological material, but I think it was only necessary for extremely skeptical individuals. Nice one, like reading your blog, waiting for more.